Louis Zamperini (Jack O’Connell) was constantly getting himself into trouble when he was young. When his brother Peter (John D’Leo) sees just how fast Louis can run, he convinces Louis to become a runner. As Louis trains, he eventually gets good enough to make it to the Olympics. When World War II starts, Louis becomes an aircraft gunner. During a mission, his plane crashes into the Pacific Ocean. Louis and the 2 surviving crew members Mac (Finn Wittrock) and Phil (Domhnall Gleeson), are left floating in the ocean with only 2 lifeboats and minimal rations. Adrift for more than a month, they struggle to survive. Eventually, they are rescued by a passing ship. Unfortunately, that ship is part of the Japanese navy. They are taken on board and sent to an interment camp. The survivors are brutally beaten and tortured by their captors. They must do whatever is necessary to try to survive the savage conditions until they can hopefully be saved. 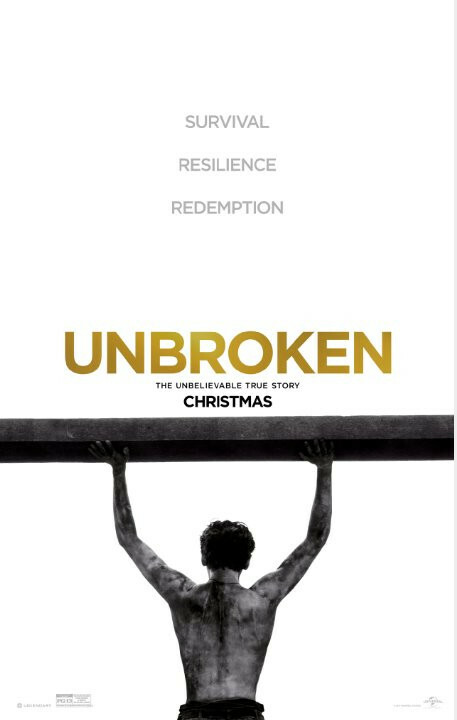 Unbroken is based on the true story of Louis Zamperini, Olympic runner and prisoner of war. The story is an amazing tale of what this man endured during World War II. It is almost hard to believe that one man could have such luck to find himself stranded at sea for more than a month and then “rescued,” only to have the ordeal get worse. The film doesn’t give enough background on Louis to understand who he really is. You only see that he is an Olympian who got his start running after a troubled youth. During the scene at the Olympics, a Japanese man nods at him. I expected him to make an appearance later in the film, perhaps as one of the prison guards. They never showed that man again. That particular moment in the film seemed unnecessary. One of the leaders at the interment camp, however, did recognize him as an athlete. But that is about the extent of how deep the story goes. There isn’t enough here for you to really care about the characters in the story. You get to see the torture that prisoners of war experienced while detained, which is enough of a story, without making it about a specific person. I just wish they would have given more reason to feel for him. There have been many films before that show the kind of treatment prisoners of war receive. Unbroken adds little to the mix, aside from the fact that it is based on a true story. While an intriguing story, I wouldn’t rush to see Unbroken. Wait until you can pick it up to rent.